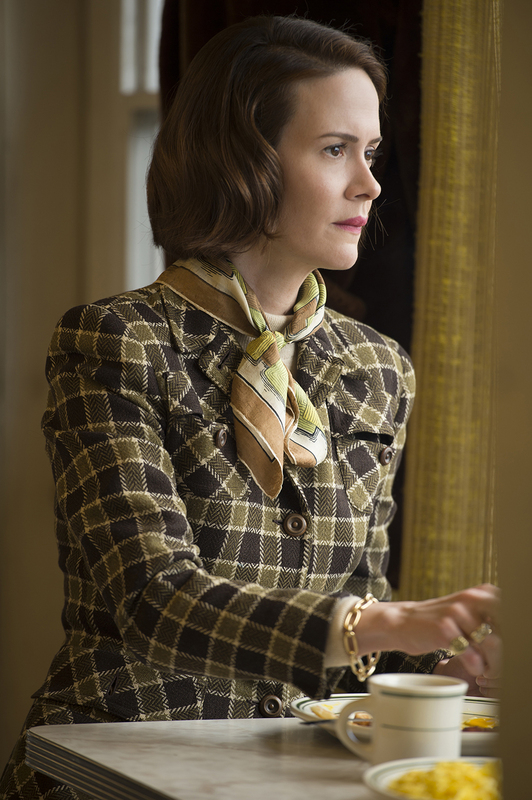 SARAH PAULSON stars in CAROL ©The Weinstein Company. CR: Wilson Webb. The three-time Academy Award winning costume designer says it was a fun challenge to pull together the wardrobe for this elegant drama given the small budget she had. For “Carol,” the titian-haired pixie-like Powell had to come up with a visual palette that matched the characters in early 1950s New York City. Blanchett plays the title character, an alluring middle-aged woman trapped in a loveless, convenient marriage. Out shopping at a tony department store, she spies Therese Belivet (Rooney Mara, “The Girl With the Dragon Tattoo”), a young clerk in her 20s, and there is an immediate attraction. Soon, the innocence of their first encounter dims and their connection deepens. When Carol breaks free form her marriage, her heartbroken husband (Kyle Chandler) begins to question her competence as a mother as her involvement with Therese and close relationship with her best friend Abby (Sarah Paulson) come to light. The film is adapted from Patricia Highsmith’s novel “The Price of Salt,” first published in 1952 under the pseudonym Claire Morgan, due to the book’s then taboo lesbian content. Q: Could you talk about coming up with the color palette for the film’s wardrobe? Powell: I don’t know where it came from. The palette for the whole film came from Todd (Haynes, the director). He was very clear from the beginning, visually, how he wanted it to look. He does a tremendous amount of work beforehand with visuals. So he provided a look book for all of us creatives. It’s all of the images that have been going through his head. What he’s looked at for inspiration, whether it’s stills from other films, whether it’s street photography, paintings, so there was a mixture of stuff— photos by Saul Leiter, Vivian Maier, even Edward Hopper paintings, little bits out of fashion magazines. When you look at all of that, there’s sort of a palette that’s happened with all of his images that he’s chosen and pulled together, so there was a feeling already there. We know that it’s New York set in the winter, so there’s definitely a feeling of what the light is going to be like. It’s set in a real world; it’s not a heightened world. It’s not (Haynes’ 2002 “Far From Heaven 2.”) A lot of people are expecting that, or something as visually arresting, but this is a different kind of visually arresting film. It’s set in the real world. With the Carol character, I thought of her as being wealthy, middle class. She spends money on her clothes. She can afford to. She’s actually wearing fashionable colors from the period. They’re subdued colors, but they’re luxurious. I wanted her to have a look of luxury and sophistication. The cream (color) coat, for instance, it shows wealth because you can afford to get it cleaned. The coat she wears is a pale fur as opposed to a dark fur. All the colors that go with it—they’re not dull colors, they’re colorful but they’re all of a certain palette. It’s just what I thought it should look like, plus I thought it would look good with Cate’s very blond hair. Q: You’ve dressed Cate before, so you were aware of her body type and what works well on her, right? Powell: Yes. It helps to know what shapes are going to work on her. Powell: Yes, she’s wearing age-appropriate clothing. Although, having said that, that was the period where everybody looked old. I look at pictures of my mother in 1952, and she looked older than the teenager she was. It was that weird time when 18 year olds looked old. Although Therese (Rooney Mara’s character), I deliberately made look young. She’s not in heavily structured clothing. Carol is sophisticated, elegant and grown up. It’s not youthful and extravagant. I could have done the look as up-to-date with a full skirt, but I felt that was too extravagant. She’s understated. 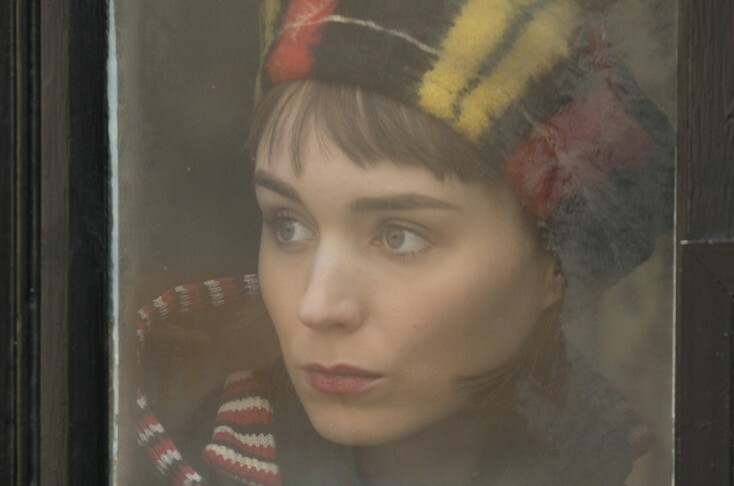 Q: It’s amazing how much Rooney Mara looks like Audrey Hepburn in this. Powell: Yeah, we did think about Audrey Hepburn. She has that sort of gamine, I suppose. She’s slightly boyish, but not boyish. Q: She wears a lot of jumpers. Powell: We call that a pinafore dress (in England). A jumper for us is a sweater. It’s the dress with something worn underneath. It was worn then. Some people have said she looks just like Carol’s daughter. It’ wasn’t intentional, because that would be too weird. It is a similar style but a grown up version. She wasn’t meant to look childish; she was meant to look young. Q: Carol’s losing her grip on her child, so maybe she’s looking for someone to look after and hold onto. Powell: Yes. That look, the pinafore dress, is really Audrey Hepburn. The dresses shaped like that that worn with flat shoes and little socks, even. Q: Was the wardrobe original or were there actual vintage pieces used? Powell: Lots of Therese’s costumes are vintage. All of them are, in fact, apart from the suit that she wears at the end, which we made. Those are all real pieces. A few of Carol’s pieces as well, like the coat. But the fur, we made. The red coat and hat were vintage as was the green one, and a couple of the dresses. But most of the things we had to make. Q: What happens to the wardrobe after the movie is finished? Powell: Because a lot of the stuff is vintage, it was rented from a rental company, so it all goes back to those companies. There were some items we had to sell back to the rental companies because of loss or damage. But there are a few costumes on display. We didn’t have many. Just a few items that were left, which I did take care of and they’re now going out to exhibitions. It’s hard to get the whole lot back again because, for example, the jewelry was all real, estate jewelry. All that I can’t get that back to put together with the costumes, unfortunately. Q: What about the shoes and boots? Powell: All of Carol’s shoes were made by Ferragamo, and were based on all their old ‘40s and ‘50s patterns. They reproduced those for me. They’re new but based on vintage patterns. They’re still producing the things that made them famous years ago. Why not? They made the shoes for me that I designed for “Cinderella,” so I actually got to go to their factory to see what they did. They’ve got a museum there. As soon as I knew I was doing “Carol,” I asked them if they’d make the shoes for me, because I knew I wouldn’t be able to find vintage shoes. If I did, they’d be in terrible shape. So it was great that they made shoes for us. Q: When you put together a wardrobe, do the costumes also tell a story? Powell: They should, if that’s the point. Q: Therese’s style changes over the course of the film. Powell: Yeah, they become more sophisticated. When she’s working in the department store at the beginning, she’s in dark colors. But then that’s part of the sales assistant uniform. They have to wear dark colors. Then, once they’re on the road, they both begin to relax a little. Carol gets out of the dresses and starts to wear separates, like knitwear. It’s softer. She wears knitwear, trousers and jackets, as opposed to the structured skirts. Therese wears more color. She has a red sweater. Then, at the end, she really changes because they have that gap where Carol leaves and they don’t see each other and Therese gets a job at the New York Times. Then, she has her first grown up black suit. She’s come into her own. She’s got a steady job and she spends her first paycheck on clothes. So that’s the first real change. Carol comes back and says, “You’re looking fine,” or something. She’s noticed the difference. (L-R) ROONEY MARA and CATE BLANCHETT star in CAROL. ©The Weinstein Company. Q: Did Cate and Rooney have to wear period underclothes? Powell: Oh yes. Cate wore girdles, period bras and all the proper underwear. All the extras had to wear proper underwear too. Powell: That makes the silhouette. That’s what makes the shape ‘50s. She wouldn’t normally have that shape. (She laughs.) The waist is made smaller; the hips are accentuated. The jackets are shaped. They actually have padding in them. That’s the way they were built. Q: What about the clothes for the gentlemen? Powell: Big shoulders. We could find most of the men’s clothes vintage, even the suit that Kyle Chandler wears—the blue pinstriped suit. We found an amazing suit that fit him. And I made the jacket for Richard (Therese’s boyfriend, played by Jake Lacy). His plaid jacket because I couldn’t find a vintage jacket like that that fit him. Q: For the party scene, did you have to make all the costumes for the extras? Powell: That’s all rented. That’s all found stuff. We could find them all. What’s challenging is that we had such a low budget I could barely afford it. The stuff is there; it’s how we spent the money that was the challenge. Q: Did you reuse some of the wardrobe? Powell: Yeah. The extras, for instance. We had the same small pool of extras that would appear in different locations. We just hoped that nobody recognized their faces. We’d change their coat or change their headscarf or put glasses on somebody in one scene and not in another. It’s all just the same group of people. We were just changing the coats around. Sometimes, they were wearing their own clothes underneath the coats because we couldn’t afford to dress them up and do the whole thing. Q: You have a lot of period jewelry. Powell: Yeah, but Cate’s was the only stuff that was real. There were various pieces loaned by Fred Leighton from New York. Within that stuff that was loaned, there was some Cartier and some Van Cleef & Arpels. The one Cate wears in the restaurant at the beginning and near the end, is actually two broaches. Powell: I just started work on a film last week in the U.K., called “How to Talk to Girls at Parties,” which is (directed by) John Cameron Mitchell. It’s such a small film. It’s set in 1977 London with a punk backdrop and it has visiting aliens. I’ve got a week of fittings next week and it’s got Nicole Kidman in it.